Today we travelled just a half-hour north of Mackay to Cape Hillsborough National Park. It was another world! This is natural Queensland in all its splendour! There is a camp booking and supply store and miles and miles of untouched bushland. There are camping grounds and a few cabins to rent. 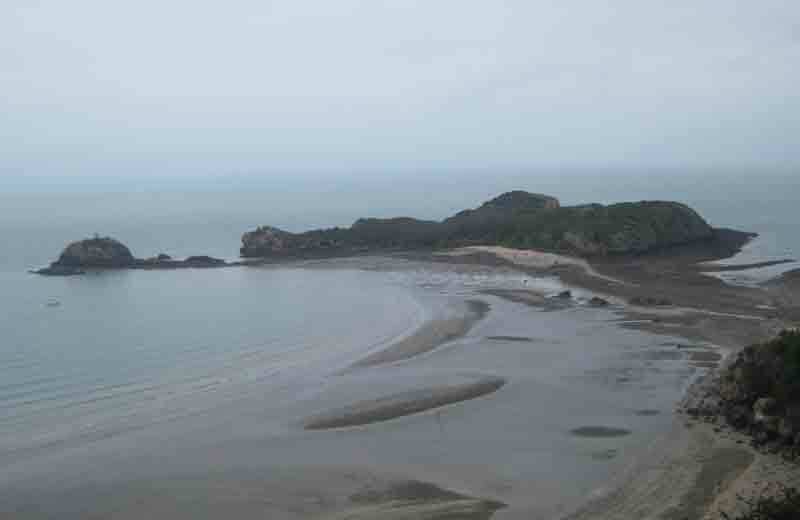 There are endless beaches on both sides of the causeway to Wedge Island. Kookaburras laugh upon your approach along the trails. Unlike to "looney" laugh of the loon, the kookaburra's laugh is very infectious and you can't help smiling along with it. The bird itself is a member of the Kingfisher family and both varieties found in Queensland are beautiful. I thought I had captured one on camera, but it was unrecognizable when I examined the shot. You will have to google it to see one. 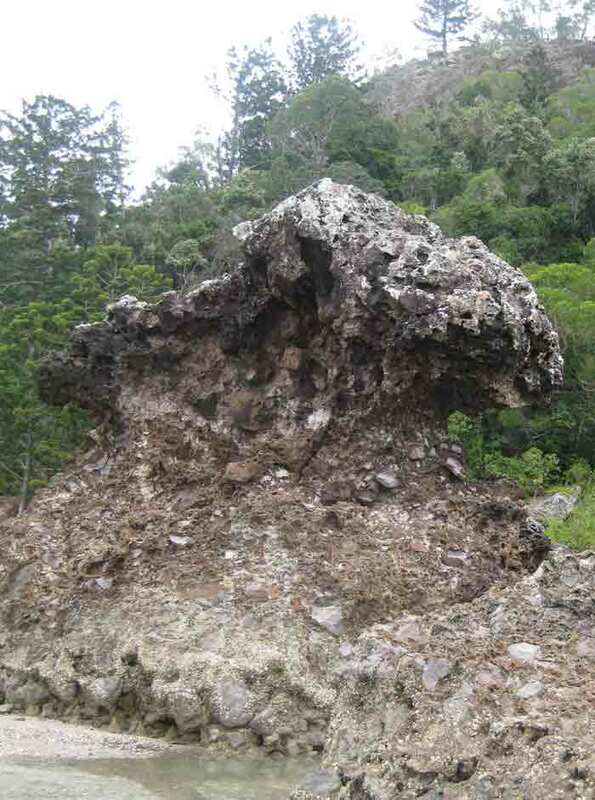 We started our exploration by walking the length of the beach and passed incredible rock formations, such as this one. The rocks towered over us. Since it was almost low tide, we tried to walk up to the exposed causeway to Wedge Island. Only at low tide is the approach possible. The rest of the time it is underwater. However, we quickly discovered that it is surrounded by thick grey viscous mud. We tried wading in it until it was almost up to our knees and then decided it would be better to retreat. Dozens of people were out walking along the beach, some were up to the tops of their hip waders fishing from the water's edge. Children were building dams and sand castles. What an idyllic spot! 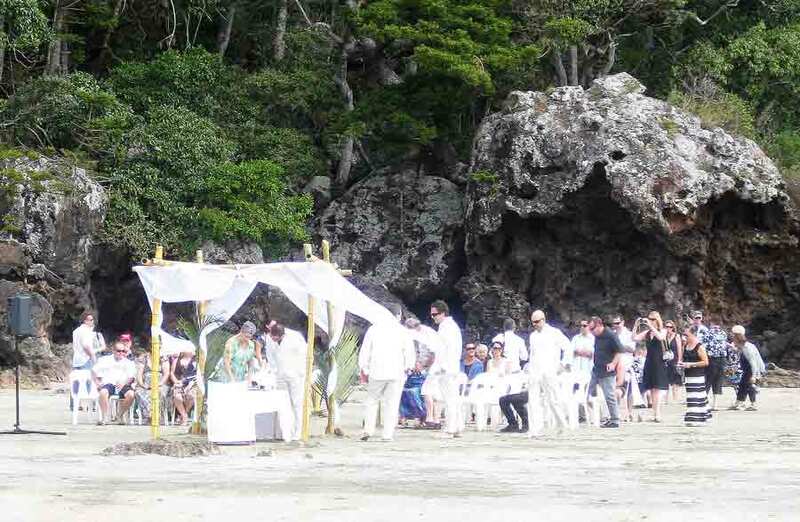 As we returned to the campgrounds we watched preparations for a beach wedding. I don't know how they were going to manage with the high winds trying to blow away the bridal canopy! We had a lovely lunch at the camp office/store then asked for directions to the trails. What a wonderful way to pass the afternoon- exercise and fabulous views! I had put on an ACE knee brace and it worked a treat. It was quite a strenuous walk with caves alongside at one point and many many steps and scrambling over tree roots. Except for biedsong it was silent. At the highest point we stopped to admire the view to Wedge Island. There we discovered we could have walked the causeway from the shore had we travelled a little further. The causeway to Wedge Island as seen from the trail. 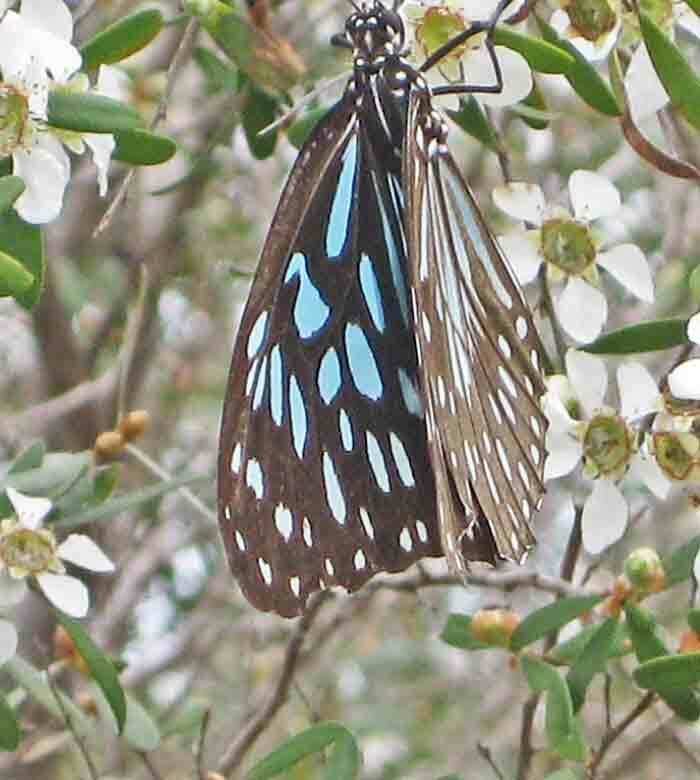 Queensland is noted for its butterflies and they were everywhere. I counted at least a dozen different types. As I neared one small bush I was enveloped by an entire cloud of these blue butterflies taking wing! 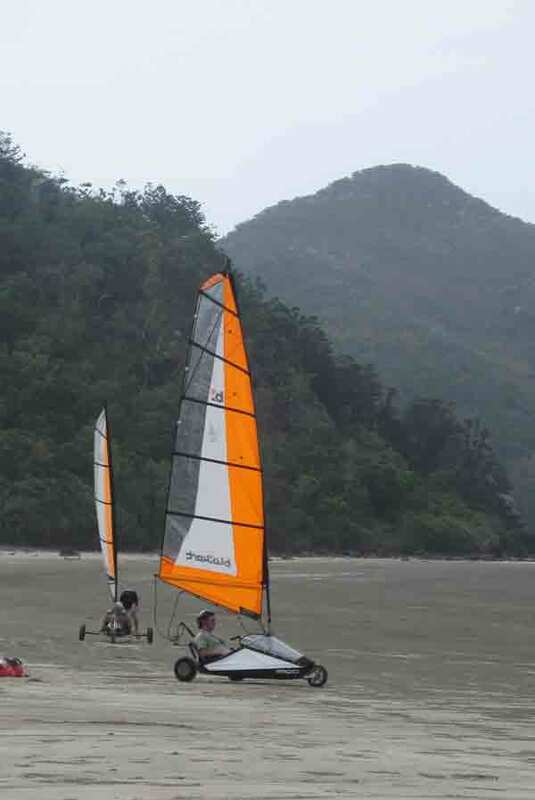 As we were heading back to the campstore, we stopped to watch two young men sailing along the beach. We would very much like to try this someday! Great "sailing" and no marina fees or engine repairs! 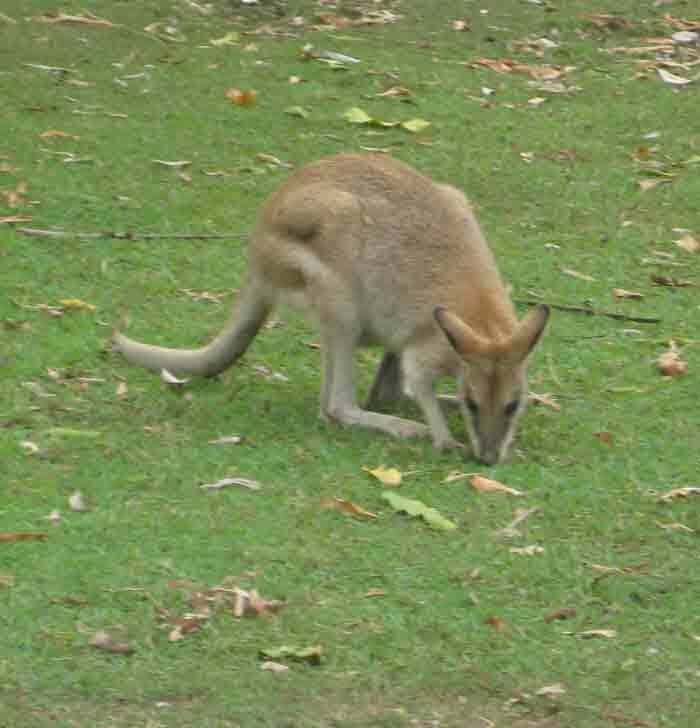 our first wallaby grazing on the lawn! What a wonderful ending to a delightful day!